TRUSTED VOICES The following is a guest post by Janet Aronica, the community manager at social business hub oneforty. For any business just getting started in social media, the first things I recommend are listening to what your current and potential customers are saying about your brand and industry before you engage with them. How? Look for opportunities to engage in a human voice with people who are talking about your industry and offer helpful insight. For a local business, though, it’s more strategic to focus on local searches. This is called geo-targeting, and it’s very important for targeting your efforts. If you’re still just jumping into social media, two ways you can geo-target your monitoring are by using Twitter’s Advanced search and subscribing to an RSS of a local search for the terms that matter to your business. Also, you can sign up for Twilerts to receive an email digest of your search terms. 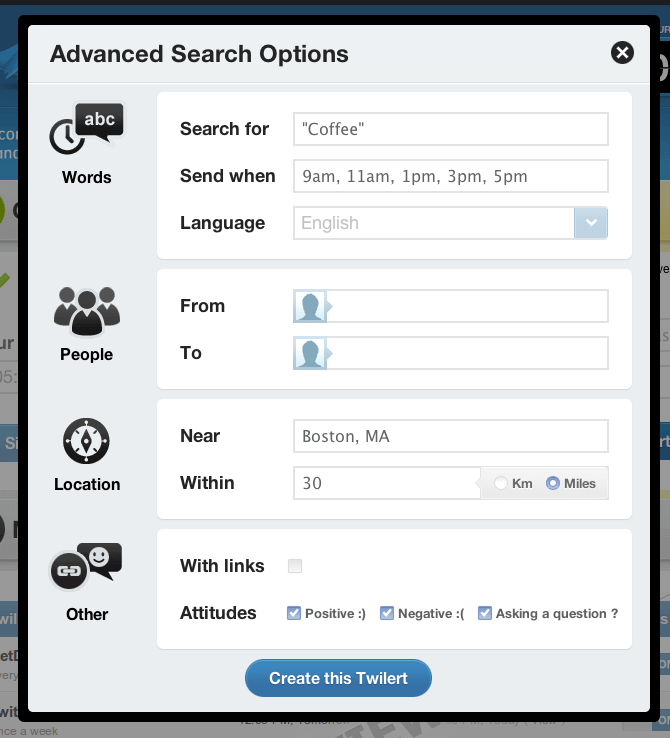 MarketMeSuite gives you the power of Twitter’s advanced search with geo-targeting and sentiment options but it a fantastic interface that makes your replies easy-to-manage. The Reply Campaigns section lets you monitor multiple saved searches all at once. You can load pre-written Twitter responses to question-phrase search terms and select those as your responses to leads on Twitter. In addition you can label and organize your Tweets with their Dotted Tweets system so you can keep better track of your keywords and responses to them. MarketMeSuite is still simple and affordable enough for a small business just getting starting in the space, but the interface is just a little more sophisticated than a plan-old Twitter client so you can stay organized with your social media campaigns. If you’ve been at the social media thing for a little bit and you want to really identify who is talking about your company in your location, Valuevine is something you want to consider. Valuevine checks out Tweets, FourSquare checkins, Yelp reviews and Facebook “likes” and mentions of your business in specific locations to identify your biggest fans and critics. This helps you nail down who you should be interacting with. This is particularly helpful for franchises with several locations. To you, it’s a local spot – but you’re part of a larger brand. Monitoring mentions of that brand on Twitter is going to get hairy, but Valuevine is going to help narrow things down for you. Last but not least, Nimble is a crucial part of your social media plan because this is how you will keep track of your relationships. Add tasks, keep track of meetings and monitor incoming messages to your Twitter account all from Nimble’s dashboard. Jumping into the social media game is a great first step to engage with your current customers and generate leads for your business. Targeting those efforts to your location is how you’ll make the most of your time interacting in the space.